Statistics show that more than 80% of people around the world experience back pain at some stage in their lives. Many people think that back pain indicates a serious underlying medical condition, but that is not always the case. Most of the times, back pain is the result of your bad habits or unhealthy lifestyle. You can give up some habits to keep your back healthy and avoid back pain. Keeping your back straight all the time is important for keeping your back healthy and preventing back pain. Unfortunately, people forget this golden rule due to the stressful everyday life. Here are some lifestyle problems and bad habits that may be contributing to your back pain. You need to keep your back straight and avoid putting too much pressure on it, especially when your work involves lots of standing and bending. It is true that you are likely to hurt your back when your occupation involves heavy lifting, but you may also put too much strain on your back when you are an architect, nail stylist, cosmetologist, engineer, driver, or office worker. The best thing is to take short breaks from work and give your back some rest for a few minutes after every hour. It is even better to move around a bit to stretch your legs and back a little to keep your back muscles from getting tight. If you think your back is at risk only while doing heavy lifting and other 'back centric' activities, you are wrong. There is a high chance of you hurting your back when relaxing at home. It all comes down to maintaining a right posture. If you have developed a habit of relaxing while maintaining a wrong posture, the cozy atmosphere of your home can still hurt your back. You may fail to maintain a good posture when doing certain household chores, such as preparing food, washing dishing, or even ironing. You have to give up all those habits that put your back in a compromising position. You may have to adjust your surrounding environment a little to relieve pressure off your back. Change the height of your table, sink, and ironing board to make these chores less taxing for your back. In an effort to look stylish, you may not mind wearing uncomfortable shoes. This seemingly innocent move can affect you in more ways than you might imagine. Those high-heeled shoes you love might be the reason why you experience back pain. The thing is that your shoes can change your posture, and a wrong posture can be extremely detrimental to your back health. You will be at an increased risk of developing serious back issues if you wear high heels for any longer than 2 hours a day. Interestingly, you may also want to avoid flats because they also put pressure on your spine. The main issue is that a wrong pair of shoes distributes your body weight incorrectly. 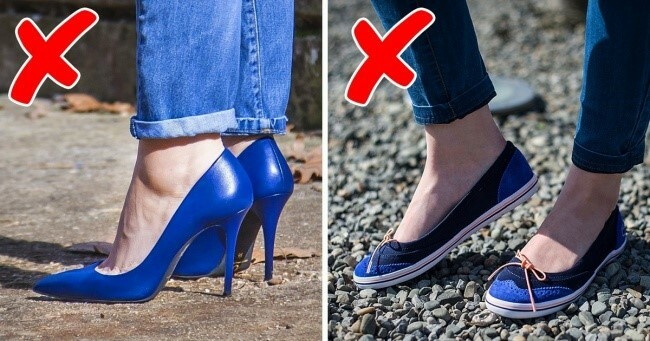 Ideally, you should be going for a pair of shoes with a low heel. One of the worst habits to give up to keep your back healthy is to avoid carrying large bags on your back. Some people carry bags to make a fashion statement, but they pay a price with a sore back. Carrying 'dead weight' around will put unnecessary strain on your back muscles and lead to serious back pain. Try to keep the most important items in your bag and keep it as light as possible. Wearing a backpack is the better option here, especially when you wear it on both shoulders. Also, ensure that you have adjusted its straps to keep it pressed against your shoulder blades. Yet another bad habit that can affect your back is to wear overly tight clothes. You may not notice it but tight-fitting clothes, such as skinny jeans, pencil skirts, and dresses with narrowed skirts can directly affect your posture by limiting your movement. These clothes may also cut blood circulation to certain parts of your body and leave you with a stiff back. Women should be especially careful when selecting undergarments such as their everyday bra, because a wrong piece with narrow straps can also lead to stiff back muscles. It is not possible to avoid stress in today's world, but it is a big mistake to do nothing to manage stress and depression more effectively. Studies have found that increased mental stress can have a direct impact on the health of your back. You change your posture unknowingly that leads to back and waist pain. Be sure to stay active because physical activity helps relieve stress. Look for a hobby that really makes you feel happy – it could be anything from running, swimming, dancing, gardening, or anything you love. The idea is to spend some "me time" to elevate your mood. Your sleeping position matters a lot because it not only affects your sleep quality but leads to back pain as well. Sleeping on an uncomfortable mattress is one of the most common reasons why many people end up developing back pain. A rigid mattress may also affect your sleeping posture, but an overly soft mattress is equally bad. Look for a mattress that helps you keep your spine straight while sleeping. You should not keep your head too low or too high when sleeping on your side. Keeping a pillow under your legs when sleeping on your back may also help prevent backache.